Singers who have something to say as well as sing, their life changing message capable of penetrating into the very consciousness of the listener, are thin on the ground. Dwight Trible, exclusively on the radar of tastemakers way ahead of the beat for more than a decade especially on account of one track, the deeply affecting ‘John Coltrane’ from the LA singer’s Living Water released over here by Ninja Tune and otherwise little known beyond his appearances with Pharoah Sanders, is certainly one of the chosen few, playing Ronnie Scott’s this week before heading north to Manchester for a Band on the Wall appearance. Closely collaborating with the singer is Matthew Halsall, the trumpeter bandleader who has produced Inspirations and which he is to release on his label Gondwana next month. Inspirations by Dwight Trible Containing a range of tantalising material including numbers by Donny Hathaway, John Coltrane, Anthony Newley, Dorothy Ashby and Burt Bacharach/Hal David, backing the singer are pianist Taz Modi, bassist Gavin Barras and the MOBO-winning former Kairos 4tet drummer Jon Scott with Halsall forming the core of the band on the recording, Inspirations was laid down in studios in Manchester and London four months apart in late-2016. 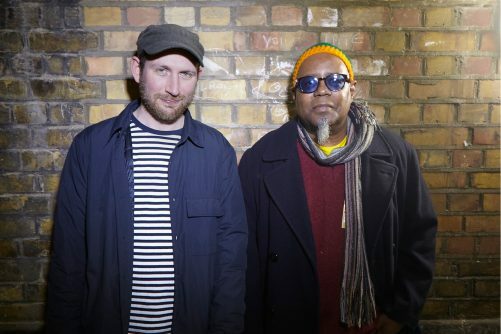 Above, left, Matthew Halsall with Dwight Trible.